This is another post I wrote for Liv-ex, the fine wine market blog. I’ve backdated it to the date of publication on the Liv-ex site. The red-wine harvest is coming to an end in Bordeaux as the last of the Cabernet Sauvignon is being picked by the top estates of the Left Bank this week. On the Right Bank, what’s left of the Merlot will be brought in shortly and then, lastly, the remaining Cabernet Franc. It was always going to be a late show, after a belated start, a wet spring and drawn-out flowering in June. Then we had one of the best summers I can remember, with sunshine for two months from the end of July onwards. The rain in the last week of September, which was nothing out of the ordinary, could have been just what the doctor ordered, provided that the rain stopped there and the sun returned. So, after all that had gone before, the fate of the harvest now rested on a dry October for the final ripening. What we got, in the end, was a mixed bag. There was also a turning point, when intermittent drizzle and humidity at the start of the second week of October persuaded many owners and managers to crack on with it – especially in St-Emilion, where they start a little later. For a few days and nights, this greenhouse effect was perfect for the development of botrytis, which had hardly been evident until now. That said, the grapes I’ve seen coming onto the sorting tables at umpteen Chateaux on both banks were in very good shape. Most are thick skinned, healthy and ripe. There was minimal rot, despite the late crop, and it was fairly easy to eliminate any in the vineyard. Uneven ripeness of the grapes has been a worry in 2012 so, once again, there’s a plethora of expensive new kit in the reception areas of the top tier of estates. 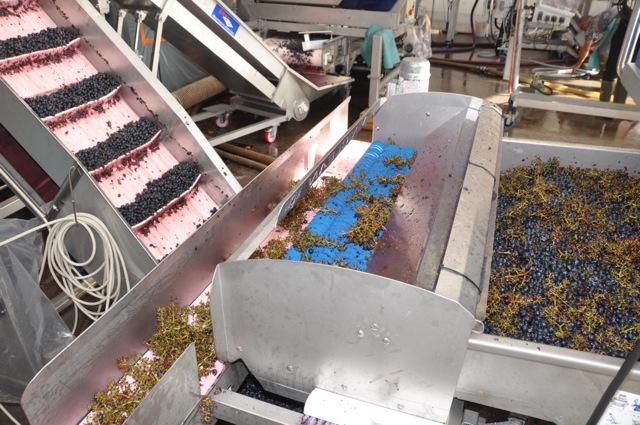 New de-stemmers, new tri-optique and other sorting systems, new systems to deliver the grapes by gravity, and so on. 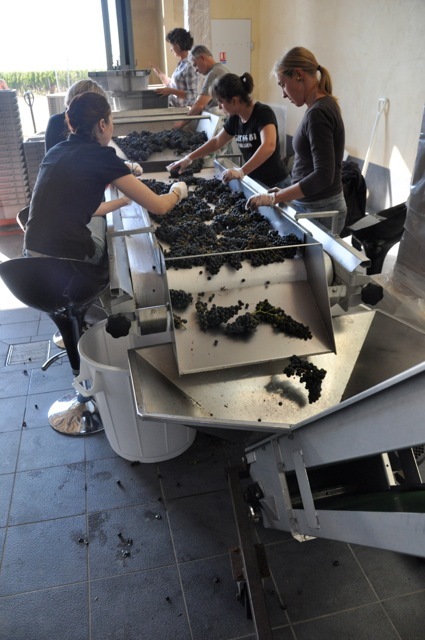 Even the conservative Chateau Léoville Barton has a new optical sorting machine – a few years ago, there wasn’t a sorting table. Next door, Léoville Las Cases has three different de-stemmer systems and two different optical sorting machines. Humans haven’t been entirely replaced, however. Picking is 99% by hand at the Cru Classés and many chateaux still use manual sorting lines, or a people/techno combination. It’s all changed in the last five years, and it’s fair to assume that ditching inferior grapes is a positive move in a year like this. It would also be easy to think that the investment in sophisticated kit is restricted to just the big names, yet that’s not the case. 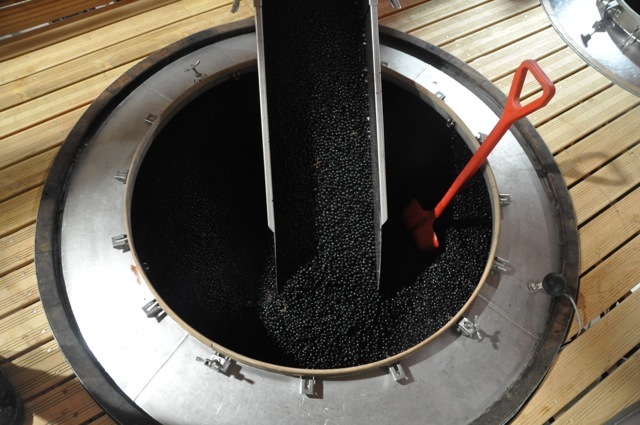 To quote one example, Chateau L’Arrosée, with just 9 hectares in St-Emilion, are using an optical sorter and then conveyors to take the grapes by gravity to the top of the concrete cuves (tanks). With few exceptions, almost all the reds in 2012 have come in during October. That’s in complete contrast to 2011, when the red wine harvest was pretty much wrapped up by the end of September. On the Left Bank, the Cru Classés kicked off with Merlot in the first week of October 2012, then the Cabernet Sauvignon during the second and third week. On the Right Bank, Pomerol was first as usual, in late September. 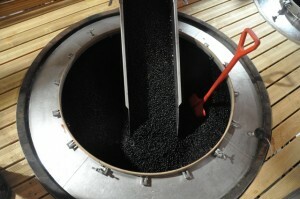 The Premier Grand Cru Classés of St-Emilion began their Merlots during the second week, in the main. As for the whites, the Sauvignon Blanc and Sémillon for dry wines were largely picked in mid-September – mostly before the rain in the last week, and under clear skies. Meanwhile, I only went to Sauternes before any noble rot set in, so I can’t really comment. Time to pop down there again, if it’s not too late. Humidity in October is something that we Australian farmers are used to. I believe we only have two climates in the Golden Coast: Hot and Hotter. It's amazing! What a meaningful post and competent author! All clearly described!